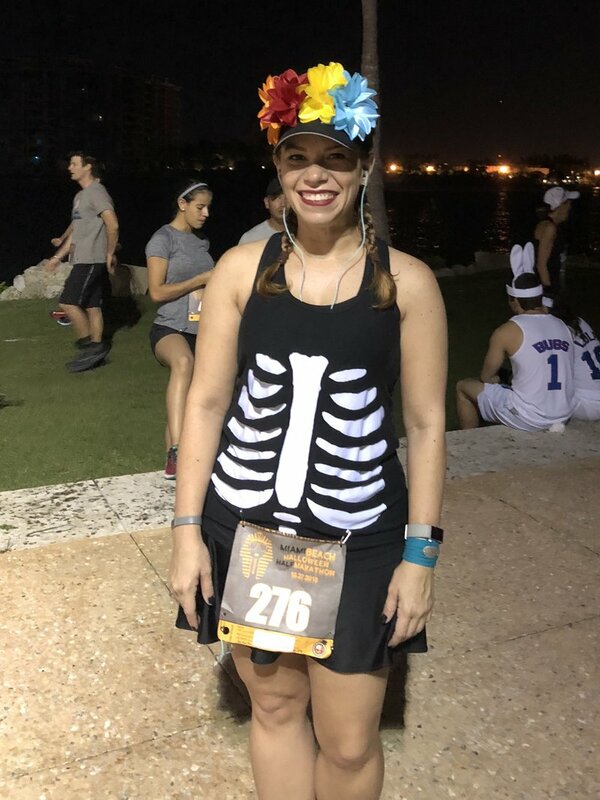 I had a Halloween themed half marathon this past weekend. 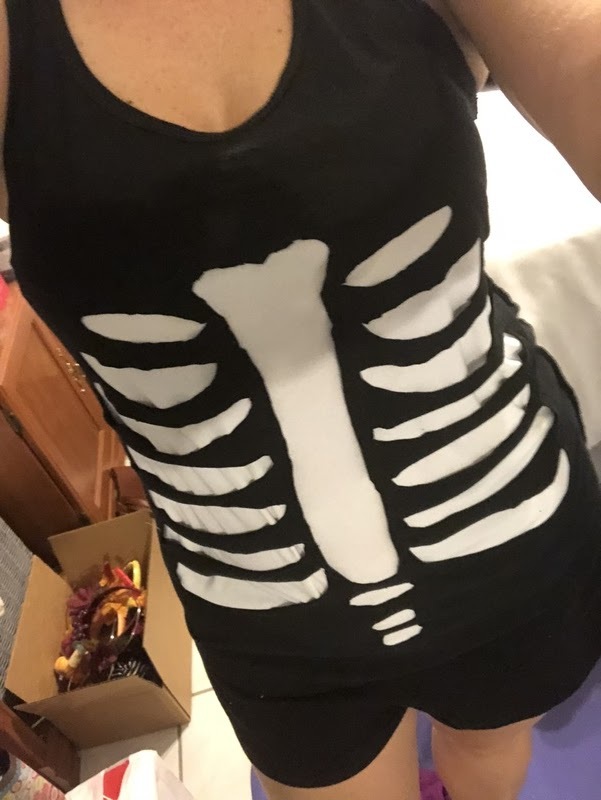 I wasn't going to wear a costume, cause I had no idea what to make, but then I had an idea. A sugar skill costume would be easy and festive. With not enough time for an Amazon prime order to arrive, I had to make something myself. Since I had left this to the night before the race, paint was out of the question. I didn't think there would be enough time for it to dry. Fabric is my medium of choice anyways, so fabric it was! And I had a few shirts that were in the goodwill pile that were perfect to use for this purpose. 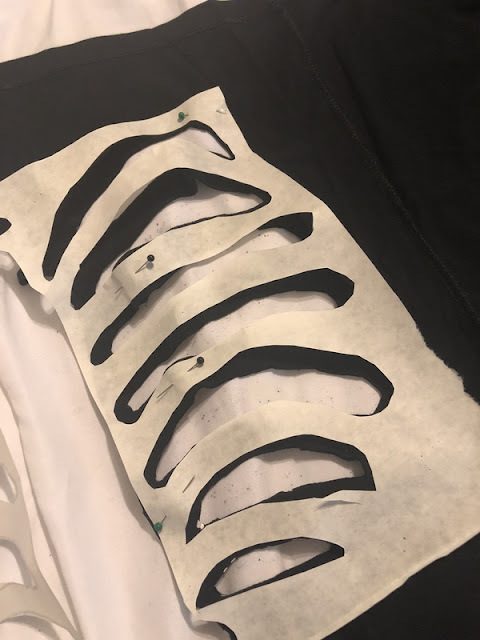 I skteched out a rough skeleton ribcage on a piece of paper, I foled it in half and cut our the "bone" parts. Then I opened it up and checked for placement on the black shirt. I found that it was easier to fold the shirt in half, and then cut out the "bone" parts on the shirt as it was folded in half. This way both sides would be even. I pinned the pattern in place, and then cut the fabric where the holes were. I also cut them a little smaller than what I had on the pattern, since I knew it would stretch out when I put it on. At this point you can just wear this black shirt over a white shirt. It will give the illusion of the bones peeking through. 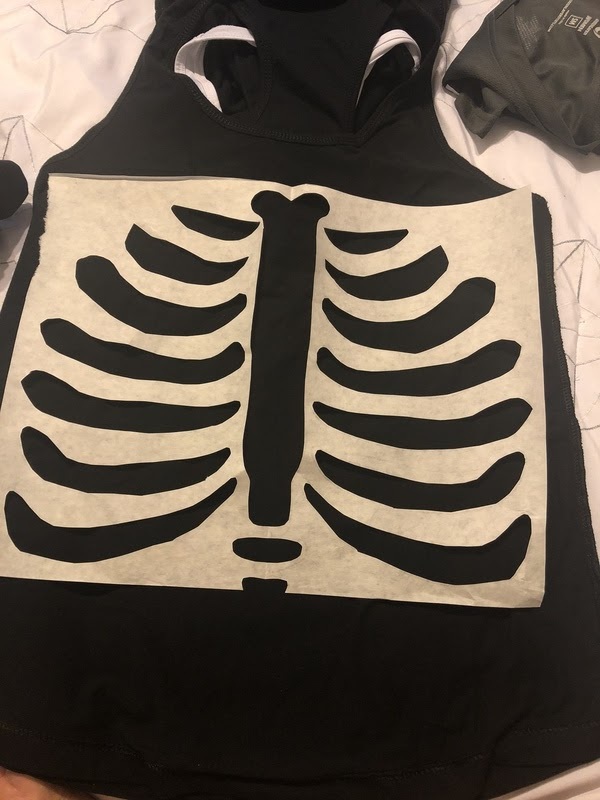 But since I was making this a running costume, I decided to sew the white part on the inside of the black shirt, so I wouldn't have to wear a double shirt for my run. *This part is optional, but makes for a lighter shirt. Cut a piece of white fabric big enough to cover all the cut out parts of the black shirt. Pin to the wrong side of the black shirt. Stitch around the edge of the cut out design to hold in place. And you're all done! Add some skull makeup to complete your costume, and maybe even some flowers for the sugar skull look. This took me a total of about an hour to put together, and the hardest part was drawing out the pattern. There's no reason not to have a Halloween costume, even if you have left it to the last minute. Happy making and happy Halloween!